Delightful apartment located on the hill of Aci Castello and Acitrezza, enjoys a spectacular view of the sea and offers its guests the opportunity to experience and 'savor the best of Eastern Sicily. Apartment is suitable for those who want to spend a relaxing holiday or for business trips. Adjacent to each tourist attraction Within 1km of the apartment there is a minimarket, bar and 1.5 km Acicastello and Acitrezza, to visit the Castle: It is said that Aci Castello and the other Aci derive their origin from Xiphonia, mysterious Greek city disappeared, probably today in the municipality of Aci Catena. The poets Virgil and Ovid gave birth to the myth of the foundation from the love story between a nymph called Galatea and a shepherd named Aci, but also from the Cyclops Polyphemus (in turn in love with the beautiful Galatea). In Roman times there was a city called Akis, which participated in the Punic Wars. Aci Trezza (Trizza in Sicilian) is a fraction of the municipality of Aci Castello, in the metropolitan city of Catania. Fishing center of ancient and remarkable tradition, is famous for its landscape. It overlooks the Ionian Sea and is about 9 kilometers from Catania. Protected Marine Area The Ciclopi Islands The panorama of Aci Trezza is dominated by the cliffs of the Cyclops: eight picturesque basaltic rocks that, according to legend, were launched by Polyphemus to Ulysses during his flight. Catania Founded in 729 a. C. from the Calcidesi of nearby Naxos, the city boasts a thousand-year history characterized by various dominations whose remains enrich its artistic, architectural and cultural heritage. Over the course of its history it has been repeatedly affected by volcanic eruptions. The baroque of its historic center has been declared a UNESCO World Heritage Site, along with that of seven towns in the Val di Noto (Caltagirone, Militello in the Val di Catania, Modica, Noto, Palazzolo Acreide, Ragusa and Scicli). of the most important international tourist centers of the Sicilian region, known for its natural landscape, marine beauties and its historical monuments and has been an important destination of the Grand Tour. Taormina has been one of the main tourist destinations since the nineteenth century in Europe. Etna is an active volcano. Unlike the Stromboli, which is in constant activity, and Vesuvius, which alternates periods of quiescence to periods of paroxysmal activity, it always appears dominated by a plume of smoke. To visit the Cathedral of Catania, Benedettini, Greek Theater, Roman Theater, Bellini Theater, Municipal Garden, museums, Castello Ursino. - on request for a fee it is possible to make reservations for excursions or tourist itineraries, excursions to the wine cellars on Mount Etna. 10% OFFER FROM 08/01/18 TO 25/03/18 PLEASE CONTACT THE OWNER. Ein elegant (mit Kunstwerken) und praktisch eingerichtetes, großes Apartment mit guter Aussicht auf Catania und Aci Castello. Es liegt im 4. Stock (Aufzug) in einer gepflegten Wohnanlage (elektrisches Tor, freie Parkplatzwahl). Um dort hinzukommen, braucht man von der Küstenstraße bzw. der Autobahn 5 bis 15 Minuten (mit oft lebhaftem sizilianischem Verkehr), trotzdem ist die Lage zum Flughafen, zu Einkaufsmöglichkeiten (z.B. in Acireale) und für alle Ausflüge in Ostsizilien hervorragend. In der perfekt ausgestatteten Küche funktionierte eigentlich alles; auch ein paar Vorräte (z.B. Öl) erleichterten die Ankunft. Sehr günstig auch die Trennung von Bad und Waschmaschinenraum (zwei WCs). Die Betreuung durch Salvatore war sehr angenehm und völlig problemlos (Italienischkenntnisse sind von Vorteil). Wir waren in einer Phase mit ganz leichtem Aschenausfwurf vom Ätna da, so dass man die eine oder andere Staubecke verstehen konnte. Wir danken Sonia und Salvatore für den wunderschönen Aufenthalt! Schöne großzügige Wohnung im 4. (obersten) Stock einer Wohnanlage für Einheimische. Es sind zwei große Balkone vorhanden, einer mit traumhaften Fernblick auf's Meer und auf Catania. Die Wohnung entspricht der Beschreibung in vollem Umfang und ist insgesamt empfehlenswert. Einziger Nachteil: die Küche entsprach im Hinblick auf Sauberkeit nicht unbedingt unseren Erwartungen. Una casa spaziosa , moderna , pulita, dotata di ogni comfort necessario, ma soprattutto con una vista mozzafiato . Al nostro arrivo ci ha accolto Salvatore , una persona squisita , che insieme alla signora Sonia non ci ha fatto mancare nulla . La loro accoglienza ha reso il soggiorno ancora più speciale. La zona è tranquilla e in pochi minuti si raggiungono tutte le località circostanti. Assolutamente consigliato ! Gute Lage , Parkplatz vor der Tür mit Tor , sehr nette Vermieterin , wurden mit einer Flasche Wein begrüßt ,nur die Straße war falsch angegeben bei FeWo do dass wir sie erst nicht gefunden haben, aber die Vermieterin hat uns dann nach Rücksprache eingesammelt und zur Wohnung geleitet . Auto ist ein muss , haben uns rundem gut gefühlt, können die Wohnung nur weiterempfehlen!!! Grazie mille, spero che ritornare presto! La casa e fornita di tutti i servizi ,piccoli dettagli particolari molto importanti da parte della propietaria sempre molto disponibile con i suoi alloggiatori , ottimi consigli per i ristoranti veramente ottimi nella zona , ci sono a pochi km vari posti da visitare con escursioni guidate . 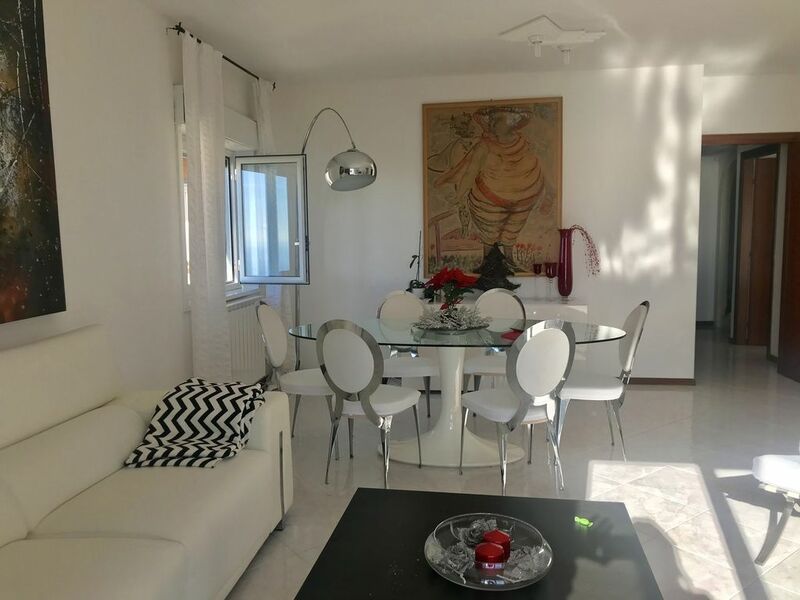 Si mangia divinamente, condominio molto tranquillo, ubdicazione ottima con una bellissima vista al mare. Speriamo di ritornarci molto presto . Grazie Alessandro sei molto simpatico, spero di rivederti presto. At 1km from the gate on the left by car you can reach a local greengrocer, with fresh products, a bakery, mini-market, a tobacconist, a pizzeria, a fish restaurant, a souvenir shop also equipped with useful products for the home and for your living room. The nearest supermarket is within one kilometer of the property. 1. 5km of the apartment, bar and 1.5km Acicastello and Acitrezza, to visit the Castle: It is said that Aci Castello and the other Aci derive their origin from Xiphonia, mysterious Greek city disappeared, probably today in the municipality of Aci Catena . The poets Virgil and Ovid gave birth to the myth of the foundation from the love story between a nymph called Galatea and a shepherd named Aci, but also from the Cyclops Polyphemus (in turn in love with the beautiful Galatea). In Roman times there was a city called Akis, which participated in the Punic Wars. Aci Trezza (Trizza in Sicilian) is a fraction of the municipality of Aci Castello, in the metropolitan city of Catania. Fishing center of ancient and remarkable tradition, is famous for its landscape. It overlooks the Ionian Sea and is about 9 kilometers from Catania. Protected Marine Area The Ciclopi Islands The panorama of Aci Trezza is dominated by the cliffs of the Cyclops: eight picturesque basaltic rocks that, according to legend, were launched by Polyphemus to Ulysses during his flight. Catania Founded in 729 a. C. from the Calcidesi of nearby Naxos, the city boasts a thousand-year history characterized by various dominations whose remains enrich its artistic, architectural and cultural heritage. Over the course of its history it has been repeatedly affected by volcanic eruptions. The baroque of its historic center has been declared a UNESCO World Heritage Site, along with that of seven towns in the Val di Noto (Caltagirone, Militello in the Val di Catania, Modica, Noto, Palazzolo Acreide, Ragusa and Scicli). of the most important international tourist centers of the Sicilian region, known for its natural landscape, marine beauties and its historical monuments and has been an important destination of the Grand Tour. Taormina has been one of the main tourist destinations since the nineteenth century in Europe. Etna is an active volcano. Unlike the Stromboli, which is in constant activity, and Vesuvius, which alternates periods of quiescence to periods of paroxysmal activity, it always appears dominated by a plume of smoke.